Do you need a reliable DOCX Converter? You are here: CoolUtils > Total Doc Converter > Do you need a reliable DOCX Converter? If you are the one who uses old versions of Microsoft Office Word or Open Office or other applications that do not support DOCX, the latest MS Word format, then you need a DOCX converter. 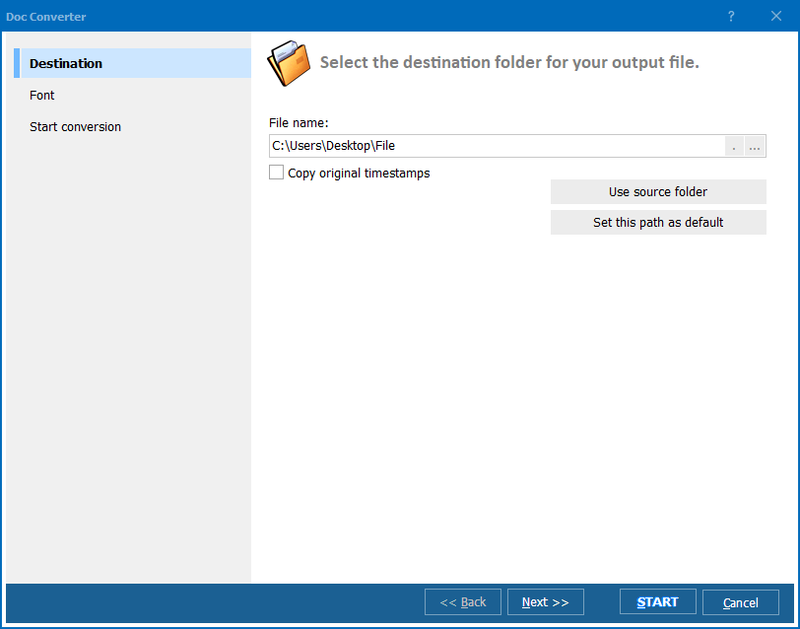 This is a special tool designed to convert DOCX files into other formats so that they can easily be viewed on computers that lack software compatible with DOCX. If you feel that a DOCX converter is exactly what you need, consider downloading one of the numerous programs available online. The two simple ways to find a good program are: reading online reviews or following your friends’ recommendations. We suggest that you choose Total DOC Converter, which is already owned by thousands of users worldwide. 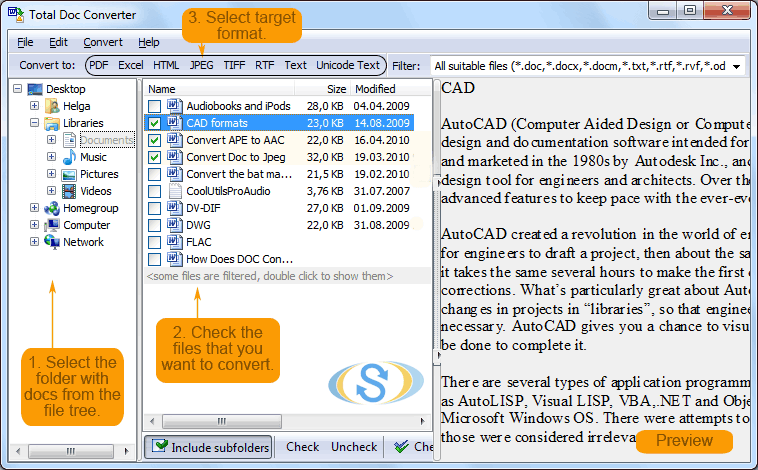 This tool is developed by CoolUtils and guaranteed to yield high-quality text documents. 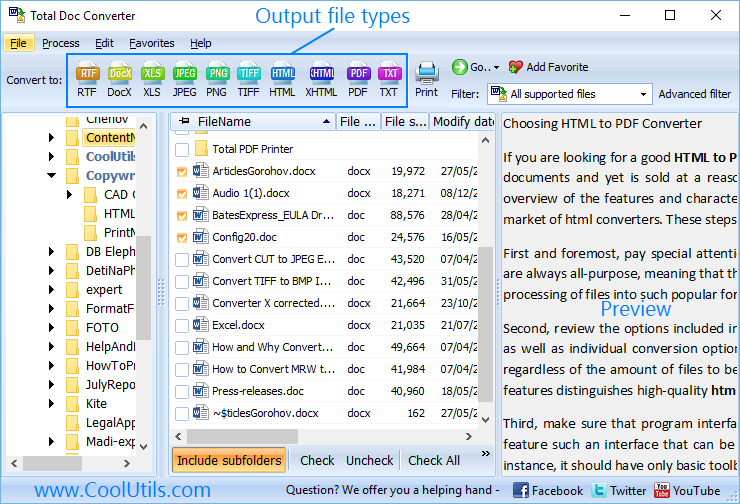 Unlike other tools for converting DOCX files, Total Doc Converter by CoolUtils is multi-purpose. This means that it is able to process not only DOCX files, but also files saved in DOC, DOCM, RTF, RVF, and TXT. The target formats supported by Total Doc Converter are as follows: HTML, PDF, XLS, JPG, TIFF, and TXT. Another feature that makes Total Doc Converter different from similar programs is its ability to preserve the metadata contained in DOCX files (author, creator, key words, subject, title). Clearly, the developers of the program guarantee that the original quality and contents of text files will be preserved by 100%. 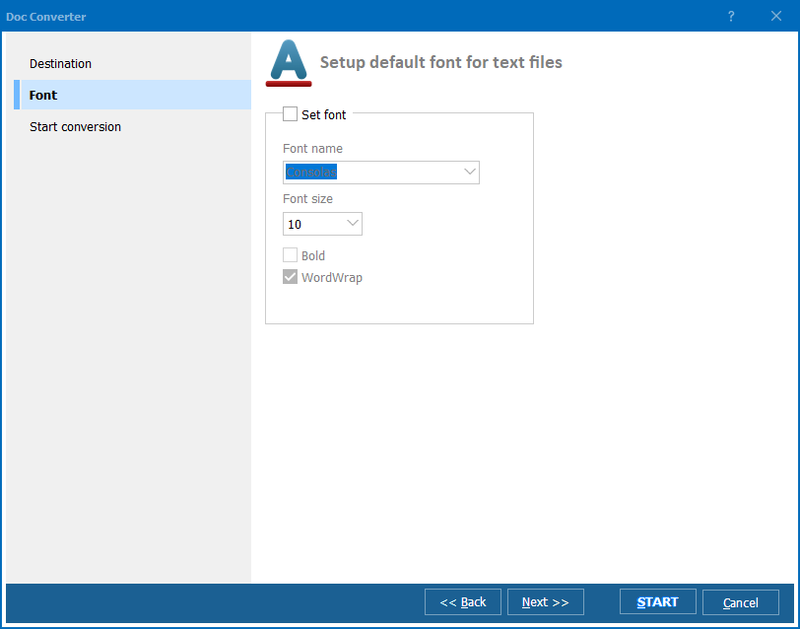 Total Doc Converter also allows you to set the format of the target documents; as such, you can choose font size, style and name and even use wordwrap function. In contrast to other converters, Total Doc Converter is very easy to use. The intuitive interface makes it suitable for beginning users, while the extended functionality makes the converter attractive to professionals. There is no need to wait and hesitate! Download Total Doc Converter right now! The trial version offered by CoolUtils to all its customers is absolutely free to use for the first 30 days.